Welcome to the Stamper’s Dream Blog Hop, I’m so thrilled to be here hopping with the uber talented Dream Team! Thank you so much for inviting me to play Michelle . . . mwah!! Stamper’s Dream is offering up some oh so yummy blog candy. And, since Michelle couldn’t put all the candy in one picture, she’s offering up two giveaways, lucky you! Blog candy photos are at the end of this post. The candy is hidden on two separate blogs, there will be two separate winners. No one knows where the candy is hidden, including us designers. To improve your chances of winning, leave a comment on all the participating designers’ blogs (links provided at the end of this post). The winner will be announced Sunday evening on Michelle’s blog. If you need help finding Michelle’s blog, simply come back here and click on this link: Michelle’s blog. I designed another purse . . . yup . . . I’m at it again . . . LOL! I drew the outline of the purse last year and saved it. 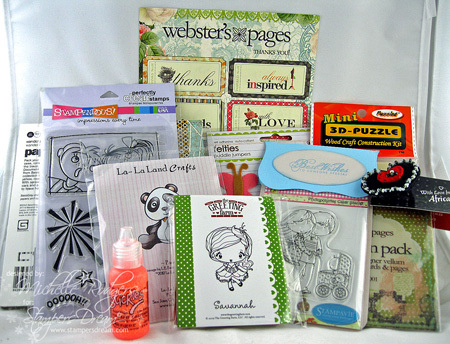 I love Alesa Baker stamps (manufactured by Impression Obsession), they are so right up my alley! To make the purse, I created a template by stamping two different size rose stamps that I received from Stamper’s Dream within the lines of my purse drawing. I masked the roses to have them overlap. I then sketched in a bit of baby’s breath and lines to look like netting. Okay, the lines are a bit squiggly . . . I prefer to think of it as wrinkles in my netting . . . LOL! Once the template was complete, I transferred it to water color paper and water colored the image with Tombow markers. I placed Kasiercraft pearls on the baby’s breath and two gold pearls on the clasp. I painted the center of the purse with a mix of Pearl Ex powder, Gum Arabic and water. I stamped the roses onto mulberry paper with Versamark and embossed with gold embossing powder, I then water colored the images. I attached the mulberry paper to the inside of the card and trimmed the edges. Versamark was applied around the edges of the purse and sprinkled with gold embossing powder and heat embossed. I stamped a sentiment from JustRite’s Friendship Nested Sentiments on the inside of the card. 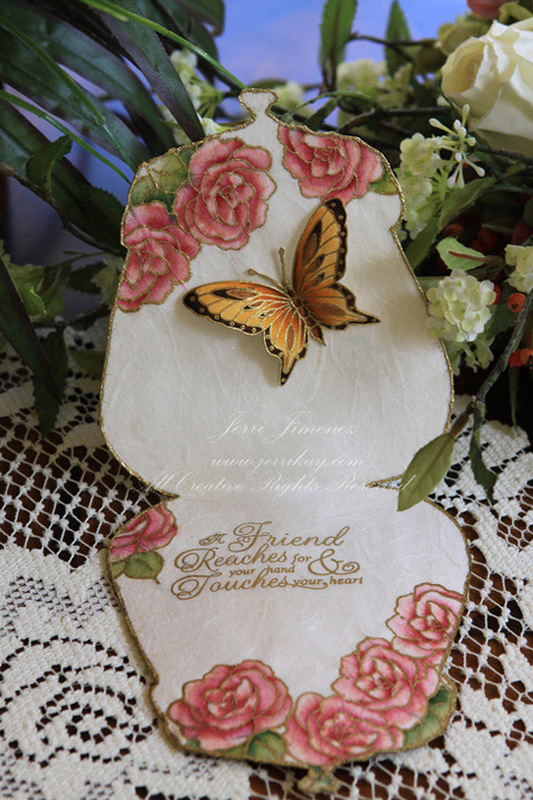 You can see the striations of the mulberry paper in this photo in the roses, as well as on the white portion. 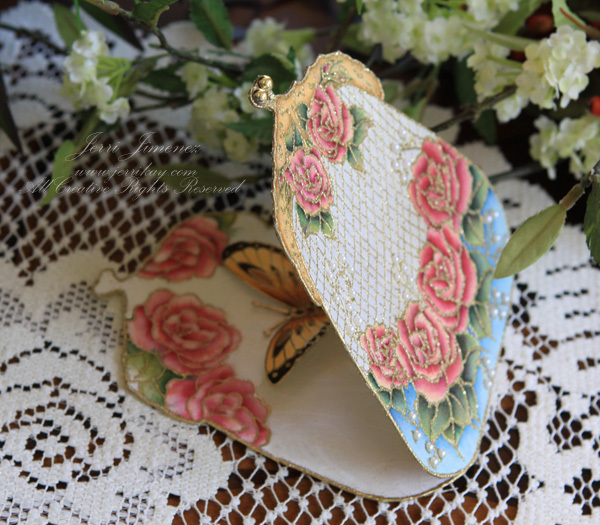 The rose stamp is so beautiful, I used the larger of the two for the inside of the purse. 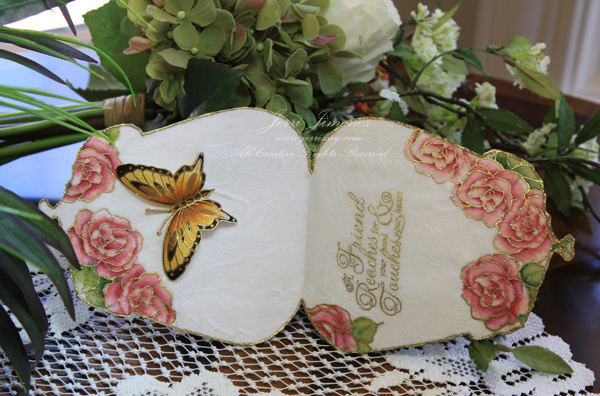 The butterfly was stamped using a Pergamano Butterfly stamp set. This photo gives you a better view of the roses and leaves at the bottom of the inside of the card. When the card is laying flat, it pops up, as shown in this picture. You can see the roses and butterfly. It looks very pretty laying on a side table surrounded by a bit of greenery. 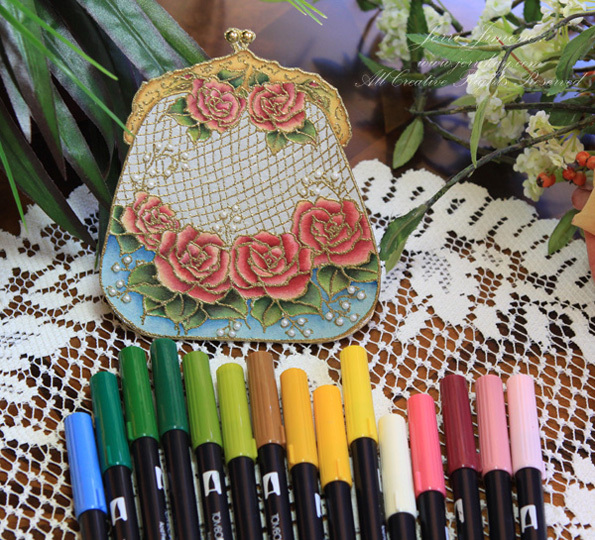 Tombow markers used for water coloring the card: Flowers-761, 772, 796, 757, Leaves-020, 025, 076, 098, 177, 249, 277, Butterfly & Top of Purse-025, 985, 993, 977; Bottom of Purse-526. Thanks so much for stopping by, I love it when you visit! I love the gold outline. Very pretty card 🙂 Great blog candy! You DREW your template! I can just see what mine would look like if I tried to draw anything. THAT is why I like stamps! No drawing required. LOL This is another stunning creation. Thanks for your inspiration. Fantastic job. Love everything you do!!! What a beautiful inside butterfly! This card is gorgeous. I’d love to receive it. Thanks for sharing. WOW!! Love your purse card! AWESOME! Subscribing to your blog after I leave this comment! TFS! Your purse is just beautiful. Ilove the detail of your work. Beautiful card and coloring both inside and out. I would love to have a purse that looks just like this! Your attention to details boggles my mind and makes me work even harder when I create. Incredible coloring. Oh. My… Goodness….! So, so beautiful !!!!!!!!!!!!! I LOVE THIS CARD!!!!! Beautiful! I couldn’t take my eyes off it- I wanted the beauty to soak in…. First visit to your site….blown away by purse, flowers, and fairies….never imagined such detailed wonderful work! Blog candy….hmmm…. Beautiful! I would have a hard time giving that card away. Thanks for sharing. wow! this is the most intricate card i have seen in a long time. i’m still soaking in all of the elements to it. i didn’t even catch the mulberry paper. i’m sending a friend here because she was wondering what to do with mulberry paper. this is a wonderful example for her. thanks for sharing this. This is one of the most magnificent creations I’ve ever seen, and to think you created the template yourself just blows me away! The gold embossed flowers are colored so beautifully they look real! I’m so glad I stopped by and found this gorgeous creation!! Thanks for sharing it with us! I’m totally amazed! I thought it was a real purse you’d decorated! Can’t believe the great detail you created on the roses. They take on a 3-D look and are to die for! Thanks for sharing the details. Absolutely gorgeous. Such a very clever idea to make a purse. I am going to have to try your technique. This purse is breath taking!!!! It would make an awesome Mother’s Day Present! I absolutely love your work, Jerri! The purse is absoutely beautiful. I only wish I had more time for my decorative arts. I want to make this one. Love your creation. Thanks for all the info. I thought I had the wrong site. A purse? Then I read on .. a purse card. I’m blown away. The things memories are made of for the recient. Thanks so very much for sharing. Your purse is absolutely stunning and gorgeous! This is really really beautiful. I would fall flat on my face if someone gave me something like this!! It is a gift by itself! The purse you designed is so awesome. It looks very nostalgic. The detail is perfect, especially the surprise butterfly and roses on the inside. WOW! Oh my word…. that is GORGEOUS!!!!!!!!!! LOVE LOVE it!!! I must come here more often if you do these all the time!! Absolutely love this card. Perfection! That is just stunning, makes me want to try it. It was a pleasure looking at your creative ideas, I will definitely be back . Oh my gosh!!! This is absolutely breathtaking!!! I am new to stamping and I am so impressed with this. I want to try and make one…. I need to build my stash of supplies…now I have some new items I ‘just have to have’. Thanks for the inspiration. so beautiful and detailed just like all your work. love it so much. What a darling card. I need to rush through this so I can run down and try to make one! That is SO cute. What a lovely card, love what you did to make a beautiful purse looks so real. I love your purse card. It’s so elegant. I’d love to be able to color like you do. Thanks for sharing. That is gorgeous! what a beautiful card and anyone would love receiving it too. Thanks for sharing and it’s great to see that Tombow markers are still being used. How breath taking beautiful! And to think I have all the “stuff” in my stash and I would never have come close to what you have done here! I agree with you, the rose stamp is absolutely the best! Jerri, Wow, this is absolutely beautiful. I love the stamps and markers that you used on this card. How lovely. I have to keep looking at it to take in all the details. Thank you for sharing. What an amazing card. Such great talent you have. It is truly breathtaking! Thanks for sharing. Your work is absolutely beautiful and soooo detailed and today’s purse shows your terrific work again!! Gorgeous!! Thanks for sharing with us! Oh my goodness, this card is just so beautiful – thank you so much!!! That is just beautiful. love the colors and the way you blended all the colors. beautiful project. HOLY MOLY!!! that is one amazing card!!! OMGosh. . . .this is the most beautiful paper creation I have ever seen. There are so many words to describe your artistic skills. I’m not a purse person, but I want this one!!! Everything about it is just pretty. . . .love the netting technique and the pearls. Thank you for sharing your wonderful projects. This is over the top. Gorgeous. This would have taken me the rest of my life to do. Thanks so much for sharing. Never have much success in stamping on mulberry. Will try again. Jerri – your paper purse is over the top beautiful. How ingenious! Oh my, this is just breathtaking! The gold outlined embossing is exquisite! You are a fabulous artist ~ TFS!! The inside is just as beautiful as the outside. I am finding so many talented women on this blog hop. This card must have taken forever. I love it! Another beautiful creation Jerri. I wish I had a fraction of your talent :). You are truly a very very very talented lady. This is just too beautiful to be a card only. I think you should stitch up the sides, put a chain on it and use it as a purse. It is just gorgeous!!! Breathtakingly (if that’s a word! Lol! ) beautiful Jerri!!! I adore your work of arts. Such a wonderful idea too. I thank you so much for sharing them with us. Woozer! how amazing is your purse and you actually DREW IT! the talent of some people. You Go Girl! 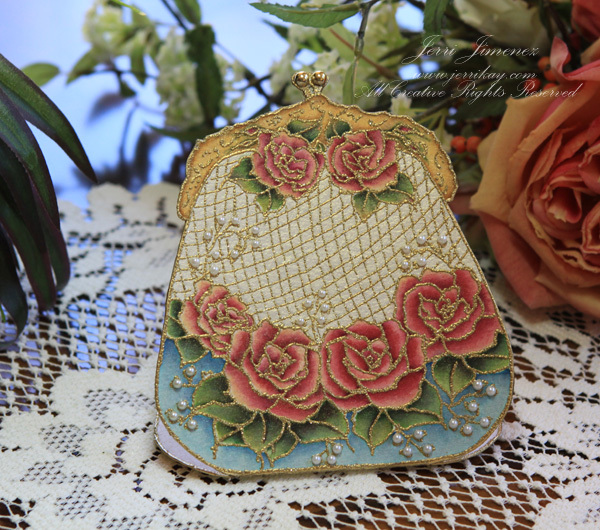 Love the vintage feel of your purse card. Absolutely beautiful. Thanks for sharing. Beautiful work- so inspiring. Thank you. Your work is simply exquisite! Fabulous, stunning, beautiful, and all the other adjectives describe your gorgeous purse. I hope I win some of those goodies. Thanks for sharing your lovely project with all of us. Have a good week-end. Beautiful roses – love the softness of the watercoloring. Thanks Jerri, for another stunning creation. Those roses really are exquisite Warm wishes. I love the blog candy. What an exquisite card. Oh my goodness! This is brilliant and so awesome! I’m amazed at how well you watercolor with those markers! I wish I had 1/10th of your talent! Oh, Jerri, your talent never ceases to AMAZE me, girl! This is absolutely STUNNING!!! This is unreal!! I’m drooling over how absolutely cool! Everything works so well together!! OMG! Your purse is absolutely stunning — breathtaking! Thank you for sharing your amazing talent with us! Cute idea! This looks so polished and professional Jerri, great job! Just beautiful Jerri! You’ve done it again! Love the hand drawn purse & the 3D butterfly is the finishing touch. You are one talented lady…your designs are such an inspiration to me! A hand drawn purse, Wow! How many hours a day do you create just to share with all of us? Loving all of it! Wow, Wow….I am in awe! This purse card is stunning. I love the effect of the gold embossing and the beautiful roses. Hugs, Teresa E.
So vintage and pink! Very cute! Oh I love this…..now I want to make a purse card……you are so inspirational….thank you so much for sharing….love it…..
Wow! Such a beautiful card! Love it!!! This is absolutely gorgeous Jerri! I love everything about it – the netting and pearls and roses are amazing! So so beautiful! You are so creative and inspiring! love, love this. i am a big fan of purses (and your work) awesome. Love the purse card, and the roses are beautiful. You are the most talented person EVER!! I LOVE your designs and how you just ooze beauty onto your site. I have NEVER been disappointed and ALWAYS overwhelmed by your work. This is no different. You are the greatest! Thanks for the chance at the candy too! Simply stunning, Jerri…as is everything you do! wow. i collect vintage purses and yours looks so real. beautiful, beautiful, beautiful. I love your purses, and this one is a treasure! If ever there was something to speak femininity, this would be the one to do it. You clever girl, Jerri! Oh my gosh! Thank you! I am wondering if I could even do this! Amazing stuff! Looks like it’s ready to go to a very special garden party. Your purse is stunning. Very beautiful. The pearls really make it a feminine elegance~! Great job on the embossing also! OMGosh This is STUNNING!!!! This card just blew me away so I simply had to see more of your ART! An hour later I’m back to comment. LOL! I’ll be back to read and learn what ever tips and tricks you have to share. If everyone is a talented as those I’ve seen thus far I’ll be here all day. Thank you for the wonderful eye candy and inspiration! Love everything about the purse. Can’t believe it was drawn and then filled in. Love the blog candy, would love to get it. I love antique purse such as the one you have portrayed here! I am just drooling over it! Your coloring is awesome & your style is certainly 2B admired! Thank you so much for continuing to share your incredible talents w/ us! Jerri, This is simply Gorgeous!! And I love how the Butterfly holds it open when it is laying flat. Just stunning!! This card is beyond gorgeous! I am in awe of your talent. Such beautiful details. Absolutely gorgeous! What an incredible lace purse card. I can’t believe you drew the template yourself. Oh My Gosh¡ Just when I thought your cards couldn’t get more beautiful! Beautiful Jerri. I love your style. I love these little purse that you make, I think all your work is just gorgeous! Ohhhhh, how sweet. I love your design. Too cute! Your work is so beautiful and INTRICATE!!! I am SO GLAD you take the time to share it with us….I know that when your link comes up, I am in for some wonderful and stunning stuff!!!! Jeri: Your art is amazing! You aren’t “just” a stamper like I am, but a true artist. This purse is adorable. And, thank you for sharing. Would love to win candy, but even if I don’t I’m so glad I subscribe to your blog. Your purse card is so detailed. Very nice! Oh my gosh Jerri!!!!! What a beautiful work of art! I am just constantly amazed at the beauty of your work! I think I’d get used to it, but I never do. Thanks for sharing your lovely creations. I know who ever receives this card will be enthralled! You do the most incredible projects! Each one is original and stunning. Thanks for providing us an opportunity to win a treasure(s). I stared at this for a long time and I don’t see any “wrinkles” in your design – I just see the beauty. What a gorgeous card! Whoever is the recipient of this card should cherish it always!! You are very inspiring to me and help me try new things. Thank you for sharing your art. And such wonderful blog candy also! This purse card is out of this world fabulous!!! I would love to make one a wall hanging with a beautiful string of pearls for the strap! Your purse card is so beautiful..a work of art.You must be very proud of your designs. The blog candy is very generous..looks good as well. Oh just beautiful. Your creations are so very lovely. WOW!!! I love your project! The coloring, the embossing, the stamps…it’s all just gorgeous! Love your purses. 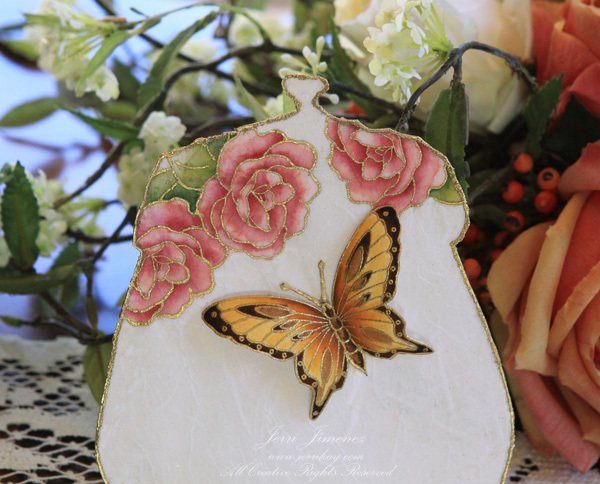 This one with roses and a butterfly inside is just extraordinary! Your work as always is Unbelieveable! Your work, as usual, is Unbelieveable! What a gorgeous and unique card! Thanks so much for sharing your creative talents! I love the artwork on your purse card. Your blog is such a pleasure to browse. What an absolutely STUNNING project. I can’t magine how many hours it must have taken you to do that. Well done! Oh my goodness, such beautiful work! Love that you created this template and the way you “decorated” it is astonishingly beautiful! An absolutely amazing work of art!! Thank you for sharing it. Absolutely beautiful! How exquisite and how delicate it looks! Thank you for brightening my world with such lovely things to think about and try. Thats amazing purse. Beautiful coloring! Absolutely beautiful card. Thank you for giving us a chance to win amazing blog candy! I love, love this purse and I am a big handbag girl! A truly amaaaaazing creation. W-O-W! Another beautiful creation. I love all the detail you put into everything. Wonderful! I just love every one of your fabulous purses, Jerri, and this one is no exception…how absolutely gorgeous!!!!! Your coloring is exquisite and I LOOOVE all the gold embossing, pearls, and the butterfly is out of this world!!!!! This is exquisite! I can’t even imagine how much you would sell this for! The butterfly is absolutly beautiful. I checked out the stamp you used but how did you make it and give it so much dimension? How absolutely adoringly gorgeous is that?? LOVE LOVE LOVE it!! Oh, I love this gorgeous purse, Jerri! Beautiful purse. I love your coloring and the details are wonderful. WOW, what a beautiful work of art. It’s exquisite. I do love the way you use those Tombows to create such stunning pieces. Love your project! You always create such feminine, detailed masterpieces! Wow Jerri what an awesome card! Love, love the butterfly! Your work is always beautiful Jerri. I love the little purse. Great watercoloring technique and I love the flowers. This is gorgeous Jerri! Beautiful job on the coloring. Love the butterfly! Your creativity always amazes me! Beautiful butterfly! This is the first time I have been on your site and all I can say is “WOW”… What beautiful work you do!! So unique and stunning. Thank you for sharing with others. I don’t even know where to begin, your card is SO beautiful! Love every single thing about it! The purse looks awesome Jerri! I love the slightly squiggly lines of the netting, it makes it look more realistic, the netting moves around on those purses you know. I think everything you do is perfect anyway. I’m so happy to see so many people found this post, you can’t be one of the best kept secrets in blog land, lol. Wow…what a beauty! you did a marvelous job on that!! I have to say I’m jealous about your skills with those markers! I’ve tried so hard, but it still looks like I’m in 2nd grade! Thanks so much for sharing such a beauty! Always such beautiful intricate work in beautiful colours. This is simply stunning Jerri~ I love everything about this masterpiece. One can tell that you spent hours on it and it completely inspires us. Thank you for sharing your talent. For many of you, it is so easy to see to the depths of your being as you share your precious work! Just one word for these projects – STUNNING! Jerri – Once again your purses are beautiful, I still want to do one someday, but that day never seems to come around. Maybe 2011 will be the year. Love this purse. And, I don’t think the netting lines are crooked. Real neeting would look like this. If they were too perfect, they would look too fakey. this card is so beautiful. You do gorgeous work. Your project is GORGEOUS, as ALWAYS!! Thank you for sharing your Awesome talents. This is an absolute work of art. You are amazingly talented. Thanks for sharing this with us. I am a big fan! This is my first visit to your blog but it certainly won’t be my last!!! Your purse card took my breath away…. your talent and creativity is unbelievable! 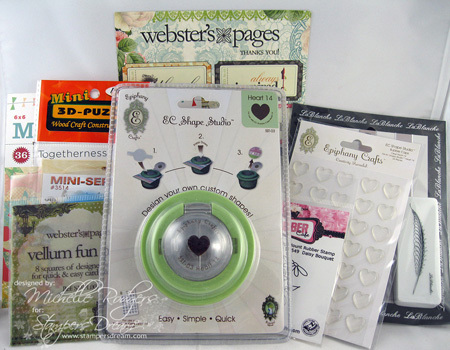 So excited to have found your blog through Stampers Dream. Jerri…..you are my inspiration. I have a following…following You. Beautiful purse. Love it!. Absolutely beautiful! Love all the variety of these stamps! Such an absolute STUNNING creation, Jerri!! Your coloring is exquisite, girl!! LOVE this!! Lovely, lovely, and more lovely. The rose stamp is just perfect. Jerry!!! Your card is beautiful beyond belief! Anyone lucky enough to receive a card like that would have to frame it inside a clear box so that it would last forever! Wow! Thank you soooooooooo much for sharing!!!! Jerri the purse card is a beautiful piece of art. Oh I love roses and the purse is just adorable! What a beautiful card and the butterfly, awesome! That has to be the most beautiful card I have seen. I can’t wait to get the supplies to make it. Your art work is beautiful and breath taking. You are a true artist. Very pretty images and coloring! Beautiful work Jerri! Absolutely a work of art. Beautiful. Jerri, what a fabulous creation!! your work is always so beautiful and so creative. hugs. Frances. OMG I love your purse card, it is so beautiful! Beautiful project, so creative and unique! Jerri this is simply adorable!! It has your name all over it girl!! Wow, this is just fantastic, what a very talented lady you are. Wow, this is fantastic. what a talented lady you are. Simply stunning. Thank you for sharing. Wow, another stunner! You have such a unique style. Thanks for sharing your talent with all of us. Gorgeous card! Love the purse shape! This is so amazing, just beautiful! BEAUTIFUL!! This is the best blog hop yet! You all are amazing with coloring and blending! Jerrikay, again your work is simply beautiful. You always have the WOW factor! TFS. The candy contest is such a nice extra. Thanks. WOW Jerri – this is the most fantastic purse you’ve designed. I love how you’ve put it all together and incorporated those gorgeous flowers… The inside is as excuisite as the outside – and the butterfly is so beautiful. I can’t believe its made out of paper – absolutely stunning. Absolutely beautiful. Flawless work! This would be a treasure for someone to recieve. My goodness, what a beauty! You’re sooooo talented. I remember your first purse and was in such awe. I’m in awe again. You are so talented. I love your purse design. I love these blog hops, too. It’s so much fun to discover all the fabulous designers out there. Thanks! love this so much. can’t beleive you drew a template, i can’t draw anything, not even the proverbial straight line. Amazing card! You are very talented and the coloring is perfect! I just love your card. The gold makes it so elegant. Looks like you spent a lot of time on it. Something someone would cherish to receive. Oh my not only does the outside look Gorgeous but your inside is just fantastic too! Love the texture the paper gives on the inside and the front looks so real with the “netting” done that way, Beautiful creation! My goodness Jerri, look at all the responses! Everyone of these ladies feels like I do. I just love this new creation!! Your top drawer Jerri! An amazing and talented designer. I love it when you just decide to make your own template. My late mother use to say, “girls, there’s not a $1 worth of material in that, let’s go home and make something.” I had to take a second look at the purse closure (my eyes) and then realized how you created it – Brilliant! Question: did you hand paint the edges of the purse and the netting with the Pearl Ex powder and gum arabic? oh boy, that is absolutely a gorgeous project. Love all the elements. Your stamping and coloring is fabulous. I soooooooo enjoy admiring your work, but have never been brave enough to try to case any of it. This is just gorgeous. Thud!! It took me a whole day to pick up my jaw fro the floor! Seriously, Jerri, this is so amazing! So glad you joined in the SD blog hop! Your project is beautiful! Roses are my favorite. Thanks for sharing. I have to agree with all the comments, these are gorgeous. Thank you for sharing your beautiful work. Your purse is one of the sweetest cards I think I have ever seen. The beautiful pearls and gold embossing on it with those amazing roses…AND you did the template yourself! What an artist! The butterfly inside that holds it open a wee bit is just the icing on the cake. This isn’t crafting, this is art! This is so amazing, just beautiful! Thank you for sharing your amazing work and for the blog candy. Oh WOW! This is a beautiful card! You are very tallented, thanks for sharing! Such a gorgeous card, so beautiful. Just want to keep looking at it. This is absolutely gorgeous!!! I would be honored to receive this card. So unique!!! Wow! That is just to to cute and so elegant looking. Girl you are so talented. WOW- I just started following you of late and my jaw just drops every time I see your work. Incredible. Oh my goodness! That is the most elegant gorgeous card I’ve ever seen! You are amazing! BEAUTIFUL!! Each one of the cards keeps getting more amazing! Wow! Not only do we get a chance for blog candy…. we also get some GREAT ideas!! Thanks!! I always love your flowers! I must have this stamp….or stamps! I am going to practice my coloring with markers. You do it so beautifully! That purse is absolutely DARLING! this is so elegant! I am not super big on elegant, that’s just me, but for SURE this is gorgeous!! I hope you have someone very deserving in mind to receive it! Oh how beautiful is that purse. I am absolutely drooling. I have collected vintage beaded purses for years so this one really made me take notice. I love that you drew this and made it look so realistic that when I first saw it, I was almost believing it to be a real purse. You are so very talented. Would love to have one of those for my collection. Mind if I scraplift? Thank you for sharing your beautiful work. That is the prettiest thing ever. I love it. what an amazing project! I love the purse and inside and out! Wow…Jerri.. you’ve done it again! such a gorgeous purse..reminds me of the old fashioned beaded purses ladies in the 20’s and 30’s had. I have been admiring your work for years! This is breathtaking! All I could say when I saw it, was WOW!…a keeper for sure. Love your designs! Thanks for all your info. in your blogs! What can I say except, WOW! Absolutely gorgeous! I’m speechless. This is the most beautiful thing I’ve seen in some time. It looks like a real purse. The color and dimension are amazing. Oh, if I only had a smidgen of talent like you! Just a beautiful card. I love this creation. I am going to try to see if I can do it although I probably can’t but I like it well enough to try. Thank you so much for your talent. This purse is amazing. I love the soft colors and the gold together with the design. It’s fabulous. Jerri, You have a real eye for color. The shading is just perfection! I am so new to blogging and responding to bloggers. I hope this gets to you. You are an inspiration, I LOVE all the projects I’ve seen you do so far. I love the vintage look and Graphic 45 papers, too. Now THIS is what I call art. I absolutely love this. Good job! What a beautiful card. At first I was thinking it was a real purse. Even the closure looks perfect. You are soooooo talented! Absolutely beautiful!!!!!!!!!!!! I cannot believe the talent you have! Jerri, you are a superb artist extrodinaire. Take a bow! I’m in awe of your blog and your talent. This little purse just blows my mind. Thank you so much for sharing your talents and creativity! Jerri, I just love this card. I had to look twice when it came up because I thought I had hit a wrong button and ended up somewhere I wasn’t planning on, but no, I should have known it was you and your amazing work! Loving that butterfly too! I have been making flowers and butterflies like my greenhouse of paper is exploding! And it’s all your fault (and inspiration!) lol Great job on the card, love your inspiration! Blessings! What a beautiful card. As usual your watercoloring is outstanding! What a gorgeous card! You did a fabulous job!